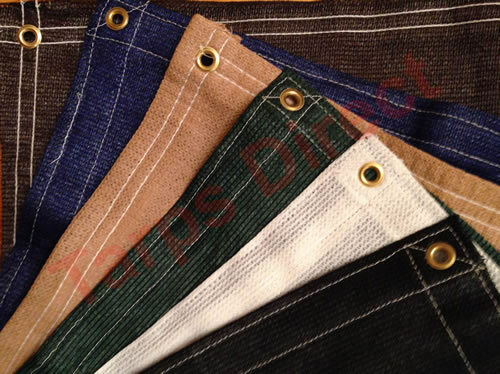 Tarps Direct's 5 oz. privacy mesh tarps have brass grommets approximately every 24" and a reinforced hem for extra strength. These tarps are UV coated for high sunlight resistance and provide approximately 87% shade. 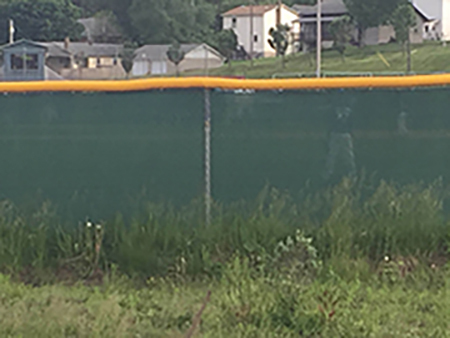 Proven applications include privacy screen or fence for construction sites along with athletic facilities such as baseball or tennis. Custom sizes available. Please call for pricing and delivery. Brass grommets approximately every 24"
Mesh privacy fence tarps are made of quality material, which means they are strong and able to withstand many weather conditions. They also provide 87% shade, which allows air to pass through, yet provides terrific visibility protection. These two qualities make these tarps great privacy screen or fence tarps. These tarps are commonly used at construction sites to provide workers with the protection they need to concentrate and get the job done without distractions. Meets municipal requirements for construction site fencing. These tarps are also great for tennis courts as either a wind screen or privacy screen. 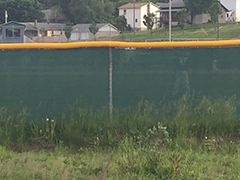 Baseball fields, especially those with chain link fences, can use these tarps as a fence screen. This provides a better background for the players in the game and will thus result in a better game itself. No matter what your use, this tarp will provide great protection and privacy!